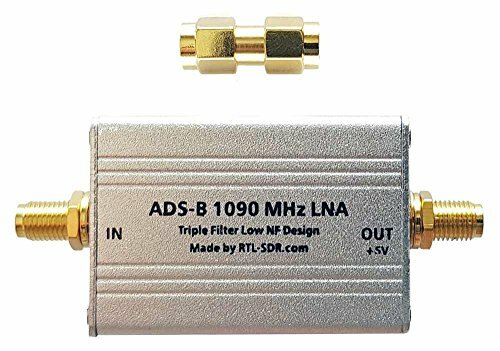 This is a high performance filter and LNA combination for 1090 MHz ADS-B reception with 27dB of gain, a noise figure of around 1dB and over 60dB's of out of band attenuation. Designed to be used with bias tee power from our RTL-SDR Blog V3 dongles with the LNA mounted as close to the antenna as possible. It is triple filtered with a low loss high pass filter on the front end, and two 1090 MHz SAW filters placed in between and after the high performance low noise figure two stage MGA-13116 LNA. The triple filter design should help avoid dongle or LNA overload in noisy/strong signal environments. Note 1: Requires 3.3 - 5v bias tee power. The RTL-SDR V3 provides 4.5v so is suitable. Note 2: This is a high gain LNA designed to be used on the antenna side with some coax cable loss. It can still be used on the dongle side, however you may need to reduce the RF gain on the dongle slightly or you may experience poor performance due to dongle overloading. See the full product release details at rtl-sdr.com/adsb-lna. Third party YouTube review available here: https://www.youtube.com/watch?v=ZNaiDBHV0T8. Please feel free to contact us here on Amazon for support. High performance ADS-B 1090 MHz LNA with triple filtering. Unique triple filter design that ensures that the dongle and LNA will not overload from strong out of band signals. Requires 3.3-5V bias tee power from an RTL-SDR V3 SDR dongle, or an external bias tee. If you have any questions about this product by RTL-SDR Blog, contact us by completing and submitting the form below. If you are looking for a specif part number, please include it with your message.